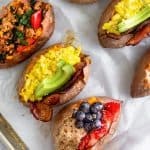 Paleo & Whole30 Breakfast Stuffed Sweet Potatoes 3 Ways make an easy, healthy, and satisfying gluten free breakfast. 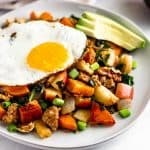 Great for meal prep or a make ahead on-the go-breakfast! Have you ever stuffed a sweet potato before? That might be a silly question for some, but I’m sure some people haven’t tried it! 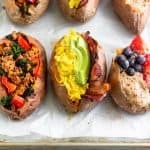 If you are one of those people, I am here to change your mind with these breakfast stuffed sweet potatoes. Whenever I need a quick meal, my go to is usually always stuffing some random things in a sweet potato. 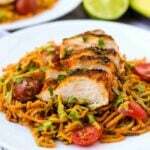 It makes a quick and easy meal and, for me, everything tastes good with sweet potato. So I figured why not take this idea and do it for breakfast! And I’m giving you a few different options to keep it interesting. 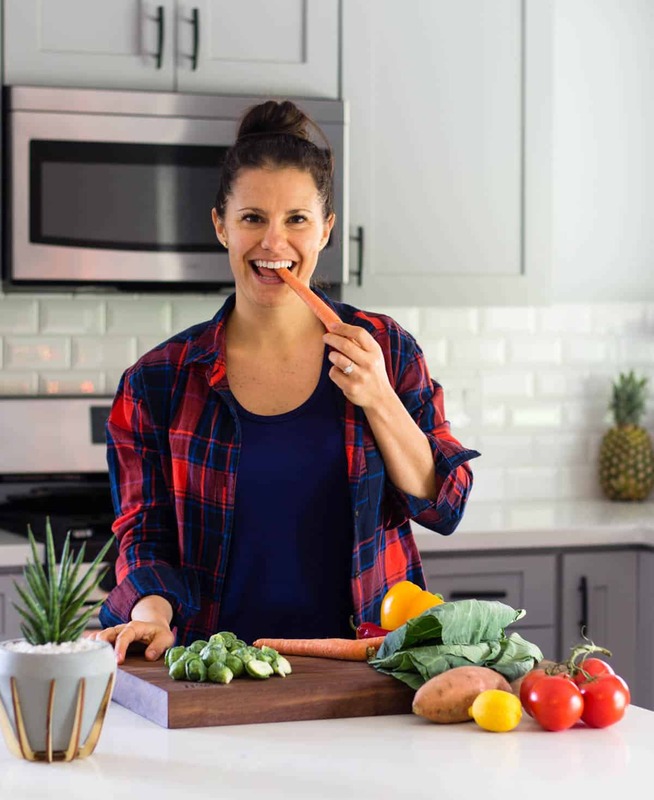 If you are making these for the work week, to make them as quick and easy as possible, I would prep most of your ingredients ahead of time (or at least the sweet potatoes). Make them night before or on the weekend and keep them stored in the fridge. Depending on what variety you want to make, you can either prep the rest of the ingredients ahead of time or make it on the spot. The chorizo and kale filling can be made ahead of time and then just everything heated up when you want to eat. You can make the bacon and eggs ahead of time and store them separately (so the bacon doesn’t get too soggy) or can make them day of. For the nut butter and fruit, you can just assemble that when you want to eat. Whichever way you make them, they make a great option for a healthy and satisfying breakfast. They are a good balance of protein, carbs, and healthy fats and are great for on-the-go or post workout fuel. They keep in the fridge for up to a week so make them ahead of time for meal prep to save time during the week. We store them in these glass meal prep containers and they stay super fresh all week long. I can’t pick a favorite, although I do love some nut butter and sweet potato, so try them all and let me know what one you like the best! 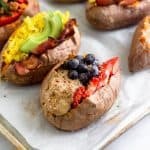 Paleo & Whole30 Breakfast Stuffed Sweet Potatoes 3 ways make an easy, healthy, and satisfying gluten free breakfast. 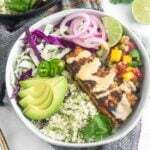 Great for meal prep or an on-the go-breakfast! In a large sauté pan over medium heat, add bacon and sprinkle with pepper. Cook for 10 minutes, flipping once halfway through until crispy. Place on a paper towel lined plate and let cool. Leaving some bacon grease behind, add whisked eggs and any additional seasonings. Turn down heat to low and continuously move with a spatula until cooked to your preference. Cut a slit lengthwise through the middle of the sweet potato. Gently press in on both ends to allow room for filling. Divide scrambled eggs, bacon, and avocado among two potatoes, splitting evenly. In a large sauté pan over medium heat, add chorizo, breaking it up with the back of a spoon. Cook for 5 minutes until slightly browned. Add peppers and cook for 3 minutes until softened. Last, add kale and any additional seasonings and cook for another 2 minutes. Cut a slit lengthwise through the middle of the sweet potato. Gently press in on both ends to allow room for filling. Divide chorizo mixture among two potatoes, splitting evenly. Cut a slit lengthwise through the middle of the sweet potato. Gently press in on both ends to allow room for filling. Divide nut butter, fruit, and toppings among two potatoes, splitting evenly. What’s another good option besides chorizo? Any meat will really work – ground chicken, turkey, beef, or just regular sausage. You can season to your preferences! Made the sweet potatoes with almond and fruit version this morning and absolutely loved it!!!! We roasted the sweet potatoes the night before so we just had to heat them up in the morning. So simple and so good!! 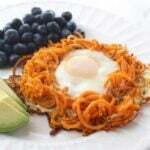 Such a creative egg-free alternative for breakfast!!! Trying a different version for tomorrow!!! Yay, so glad to hear that! Making the sweet potatoes ahead of time makes the assembly so much easier! Thanks for trying Donna! Egg stuffed sweet potato? Now that sounds like a good combination. So good! The perfect breakfast combo! For someone as obsessed with sweet potatoes as I am, I’m surprised I have never tried this. You must try it! I really love the nut butter one for a change from the typical savory breakfast!